When I tell people what I do for a living they often look at me funny. "Can you make a living at that?" they ask. Then, "What's it like?" I've decided that being A GARDENER is a fantasy to most people. They can't quite imagine I get paid for doing what most people just fiddle around with on the weekend. For the record: I do very little fiddling. As for what it's like, well that depends on when you ask me. 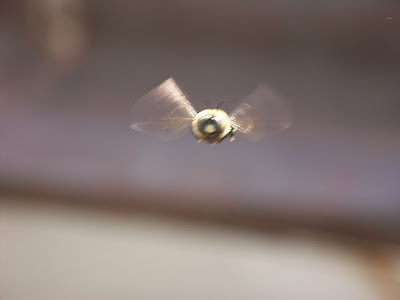 Yesterday I was terrorized by an enormous and territorial carpenter bee. Carpenter bees are about 2 inches long, black, and shiny. Males hover and swoop, both to check out possible mates and to chase away possible competition. I'm not sure which I was, but Mr. Bee wouldn't leave me alone. I felt like an idiot, dodging and ducking as he flew directly at my head. I feel even more ridiculous today, since I've learned males don't have stingers. I'll be back there tomorrow and I promise to stand my ground. Also yesterday, it was 90+ degrees. That is just too hot for April. Even if you like your work, 3 hours in the blazing sun saps your energy. When I walked through the park at the end of the day I moved at half my normal speed. What's my job like? Tiring but satisfying. and the Anemonella are in bloom. My client was out of town this morning, so I listened to music as I fertilized. I don't usually listen to music while I work, because I find it VERY hard to listen to good music without singing along. And dancing a little. Some people find that entertaining...others do not. And since I always strive to be professional I usually leave the musical performance at home. But not today. It was glorious: sunny, cool, floriferous, tuneful, and a lot better than being chased by a giant carpenter bee! Me: Should I bring my camera today? Lazy Me: Nah, it's going to rain and besides I'm already carrying my VERY heavy tool bag PLUS plants. Lazy Me: Forget it! I don't want to carry the extra bulk and weight. So, this morning I did NOT carry my camera and it's the last time I'll let Lazy Me win an argument for a very long time. There was so much to shoot on the terrace where I was working, and all I had was my woefully inadequate iPhone. The resolution is low, you can't choose a focal plain, or fiddle with aperture. Very, very frustrating. 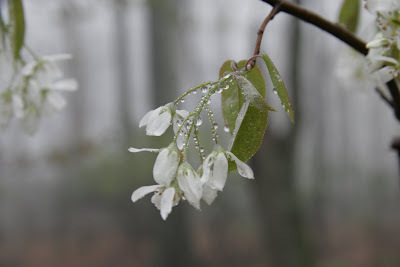 Especially on this misty morning when there was much that was alluring: tightly pleated, young Viburnum leaves, Amelanchier flowers heavy with rain, buds just starting to unfold on the Rosa rugosa. None of those pictures turned out well enough to post here (dammit!) but I offer these few to show you what's growing today in a rooftop garden on the Upper West Side. Boston ivy looks demure and manageable in early spring. Buds of staghorn sumac 'Tiger's Eye' are ready to pop. 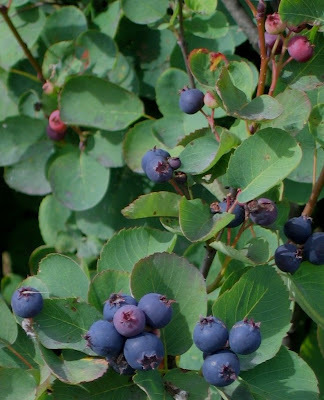 I adore Rhamnus 'Fine Line'. Next time I promise to bring my real camera. Last weekend I tinkered with a jam recipe and came up with what I now call East Meets West. Foraged blueberries from Shohola, PA and foraged Meyer lemons from San Jose, CA. I increased the lemon juice and zest components and worried that it might be too lemon-y (and not blueberry-y enough) but Michael assures me this is not the case. Combine all of the above and bring to a rolling boil over high heat, stirring frequently. Stir in 1 envelope liquid pectin (this might not be necessary since lemons have a lot of pectin; I'll try skipping it next time) then bring back to a rolling boil. Continue to stir and let boil for 1 minute, then remove from heat. Ladle into jars, leaving 1/4 inch head space. Cover and process in a boiling water bath for 15 minutes. This made 6 x 1/2 pints. If you try this with regular lemons, reduce zest to 2 tsp. and juice to 1/3 c. Meyer lemon juice is sweeter and its zest is less bitter than that of regular lemons, so the larger quantities work. Either way, it's a winner!